FRIM Selangor Forest Park is part of the Tentative list of Malaysia in order to qualify for inclusion in the World Heritage List. The site is in the suburbs of Kuala Lumpur, just about 10 minutes of driving from famous Batu Caves. 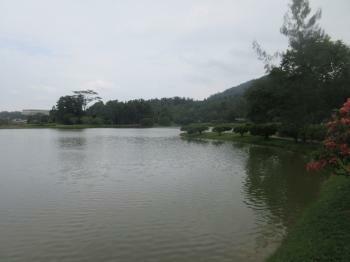 FRIM is acronym of Forest Research Institute of Malaysia and the site is quite a big park and botanical garden. Entrance fee is 5.3 RM per non-Malaysian plus 5.3 RM for the car. The botanical garden is quite nice, although it is not European style one with mostly exotic species. In fact there are only domestic ones. There should be much more adventurous walks, such as canopy walking tour but, according to the provided information, they are closed until further notice. Although the place is worth a detour if you want to take a break from big city climate of Malaysian capital, I found nothing outstanding in this place. I admit I have no knowledge of scientific work behind, which potentially may be the main reason for description (Malaysian government plans to propose it in 2020). Based on what I saw, that will not be a major addition to the List.